Why do you calibrate a CCR with pure Oxygen? We frequently get asked the question as to why we use O2 as a calibration source for oxygen sensors in closed circuit rebreathers (CCR). A CCR diver often has multiple gasses available, any of which could in theory be used for calibrating the O2 sensors in the CCR. The simple answer is that pure O2 is the best gas for a calibration source and so Shearwater computers are designed with that in mind. As to why O2 is the best gas, read on and we will make that more clear. The use of a Nitrox or other mixed gas is a poor choice for O2 calibration since the actual O2 concentration may not be known accurately enough. If the mixed gas is checked with a gas analyzer, that analyzer is typically calibrated from air; hence the calibration chain would be air to analyzer to mixed gas to CCR O2 sensor. Each step in the calibration involves errors, so it can be seen why mixed gas is not suitable for CCR O2 sensor calibration. 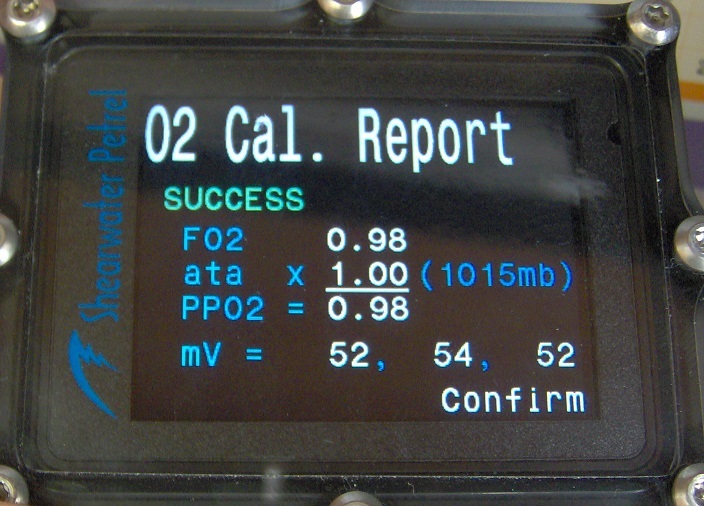 Pure O2 can be used directly as a calibration source without extra steps introducing errors. There are some rebreather electronics that allow the use of air for calibration of O2 sensors, and in fact this is required in the case of semi-closed rebreather systems without a pure O2 source. Shearwater computers do support the use of air as a calibration source, but only when in semi-closed mode. A calibration in air at 21% partial pressure O2 (PPO2 of 0.21) is significantly different from the normal breathing loop set point of 1.3 PPO2. Calibration in nearly pure (PPO2 0.98) O2 provides an advantage in that this is much closer to the typical operating range and less reliance is placed on strict linearity of the O2 sensor. Calibration in air at 21% O2 involves an electrical signal from the O2 sensor of about 10 millivolt (mV) as compared to a 47mV signal in pure O2. The lower signal is much more susceptible to analog noise and offset voltages in the amplifier circuits, so there is an advantage to calibrate with the larger signal given by pure O2. 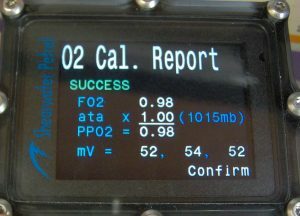 The process of analog to digital conversion in the rebreather electronics has a limited resolution, and these quantization errors are almost 5 times as significant in air as compared to pure O2. In cases where the ‘pure’ O2 calibration source may not have a precisely known O2 concentration, however, a 2% error in O2 level at around 98% nominal is equivalent to only a 0.4% error in concentration at 21%. In other words, sensitivity to absolute errors in O2 concentration is less for a (nearly) pure O2 source as compared to air. It is worth expanding upon the mention of O2 sensor linearity in the above discussion. O2 sensors are only linear for lower concentrations of oxygen, and become non-linear at high concentrations. The usable linear range of an O2 sensor decreases with age, and when this linear region becomes lower than a PPO2 of 1.6 the sensor is no longer safe to use in a rebreather. Even though a linearity test to PPO2 of 1.6 is not easily performed when calibrating at the surface, checking the linearity from a calibration with pure O2 to air (reading in air should show 0.21) is a prudent sanity check. An additional linearity check of O2 sensors at a PPO2 of 1.6 underwater is also critical, but beyond the scope of this discussion. We will also mention that the reason we use a PPO2 factor of 0.98 for calibration of an O2 source expected to be 99.9% pure is to account for some humidity in the CCR loop. Residual humidity is expected due to the diver breathing in to it to perform loop checks prior to calibration, and this humidity reduces the measured PPO2. We hope this explanation has helped clear up most questions regarding the use of pure oxygen as an O2 sensor calibration source. I am an R&D Engineer for Shearwater Research, working on electronics and software for dive computers and CCR systems. I have been an avid diver for more than 24 years, and in 2014 become a CCR diver. Thank you for this clearly written, yet detailed explanation and justification, for calibrating with oxygen. Great article. Great, clear answer. Just one point, not all of us actually breath on the loop to fill it with O2. At least on the Megalodon (and other CCRs), many divers use a calibration cap to contain a small stream of O2 directly onto the cells. In these cases, using a calibration value of 100% without any accounting for humidity is more appropriate. Thanks for your comment, we appreciate your feedback! We recognize the wide variety of rebreathers in use. The FIO2 calibration default in our computers is 0.98, but can be set anywhere from 0.70 to 1.00 to account for systems like you have or for O2 sources that are known to be less than full purity. How often do you recommend calibrating shearwater controllers and huds? I see most manufacturers recommend before every dive. The calibration process uses approximately 30L of o2 with my CCR. I have heard from several instructors say that this frequency of calibration is overly cautious and is wasteful of o2. Is there a more realistic frequency of calibration as the cells age over their lifetime and the millivolts for a fixed value of po2 fall with age? With respect to rebreather manufacturers, we prefer not to recommend against their practices. However, our electronics do not need calibration before every dive nor do we recommend it as best practice. We do recommend verifying calibration accuracy before every dive – ensuring 0.21 reading on all cells in air when the head is assembled as a sanity check. Calibrations every few dives (or once a week or two, whichever comes first) would be a better practice than every dive. O2 cell health should change only gradually, any abrupt change would be cause for concern – too frequent calibrations can mask cell changes since it resets the mV to PPO2 scale each dive. It is good practice to note the mV levels of each cell at calibration, taking note of substantial changes in any cell over time. Less frequent calibrations will also make a cell change show up as a voting disagreement if the change is large enough.